This 1 bedroom apartment with swimming pool is located in Azurville-Val Claret and sleeps 4 people. It has WiFi and air conditioning. The apartment is near a beach. Apartment, 2 - 4 people, 2 room/s, 1 bedroom/s, 1 bathroom/s, approximately 42 m², 1 floor/s, renovated 2013. Feature: Property in a hotel complex (max 4 floor(s), 2 building(s) in total, 162 units in total). Furnishing: modern, tasteful, tiled floor, laminate floor. Final cleaning by tenants or against payment, € 75. Holiday resort tax. Linen/towels available (beds are ready-made upon arrival). Change of bed linen, € 20 per bed, Change of towels, € 15 per person. Deposit € 200 (credit card only, Visacard, Mastercard, American Express). Cot free of charge (on order). Pet 1 pet allowed, € 20 per day (small pet only; please advise prior to arrival; additional animals on request only). Estate (shared use): approximately 1.7 ha, closed plot (electric entrance gate), with garden. Pool (shared use): 18.0 x 12.5 m, open all year, heatable, curved shape, seawater pool, children's pool. Pool 2 (shared use): 20.0 x 12.5 m, open all year, seawater pool. Indoor swimming pool (shared use): O 10.0 m, heated, seawater pool. Infrastructure: around-the-clock reception service, bakery service; lift, baggage storage; internet access Wi-Fi (included) in the common room, in the pool area, at the restaurant. The agent describes this apartment as an ideal holiday rental for the summer holidays. For younger guests there is some vibrant nightlife not too far away. It is also good value for money. 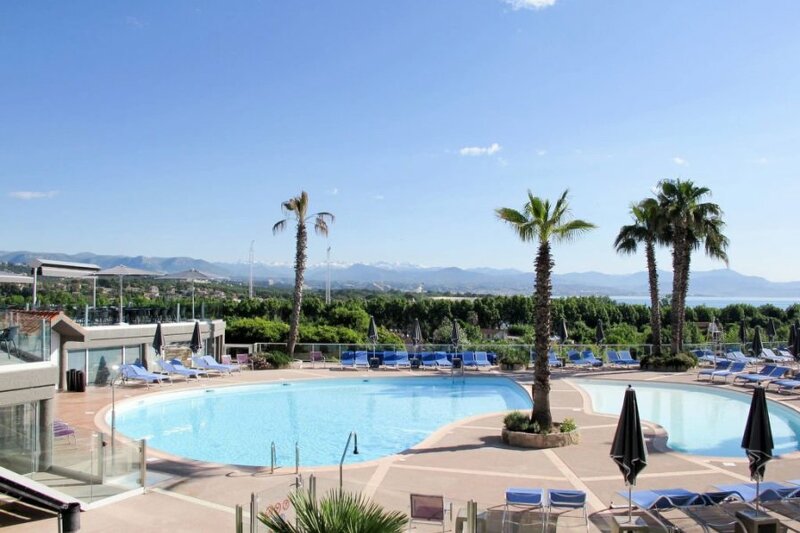 The apartment has a swimming pool and is located in Azurville-Val Claret. The nearest airport is only 20km away. It is set in a convenient location, 3km away from a beach and 4km away from the city center. The apartment has free wireless internet. The apartment is adequately equipped: it has air conditioning and a dishwasher. The property has a sauna.